Feel the excitement of Vegas-style games, including Blackjack, Hold 'Em Poker, Roulette, and dozens of wicked slots. We have progressive slots AND multi-progressives too and you can play with your friends. The CasinoEvil App gives you the shot to WIN BIG. We have one of the best-looking and most exciting apps on the playstores with some awesome spooky themed tables and games. Collect your fortune with our daily spins, hourly chips bonus and freebies! We start you off with 100,000 free chips just to try it, and give you free daily spins for a chance to win up to 100,000 free chips each day. Invite your friends to play alongside you at a table for blackjack, poker, roulette or a slot machine. Each player gets a unique player "friend code" that you can share with your friends to challenge each other. We also have a leader board and keep up with the top ranked players each day. Feeling generous? You can 'gift' another player with some of your chips. 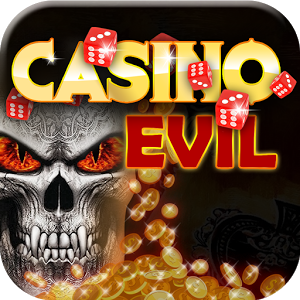 The CasinoEvil App is fun to play and exciting to WIN!